In my contribution to this seminar, I will try to frame an analytic strategy for the transcultural object using concepts related to the realms of transmission and translation. We have been talking about transculturalism as a contemporary reading norm, applicable to all sorts of artifacts. As far as I am concerned by this norm, I would try to focus specifically on the status of the transcultural object as such, along with its structural principles and cultural presence as, say, a ‘dialectical mutant’. Travel Holiday Gallery. Last modified June 19th, 2013. The Emperor—so they say—has sent a message, directly from his deathbed, to you alone, his pathetic subject, a tiny shadow which has taken refuge at the furthest distance from the imperial sun. He ordered the herald to kneel down beside his deathbed and whispered the message to him. He thought it was so important that he had the herald repeat it back to him. He confirmed the accuracy of the verbal message by nodding his head. And in front of the entire crowd of those who have come to witness his death—all the obstructing walls have been broken down and all the great ones of his empire are standing in a circle on the broad and high soaring flights of stairs—in front of all of them he dispatched his herald. The messenger started off at once, a powerful, tireless man. Sticking one arm out and then another, he makes his way through the crowd. If he runs into resistance, he points to his breast where there is a sign of the sun. So he moves forward easily, unlike anyone else. But the crowd is so huge; its dwelling places are infinite. If there were an open field, how he would fly along, and soon you would hear the marvelous pounding of his fist on your door. But instead of that, how futile are all his efforts. He is still forcing his way through the private rooms of the innermost palace. He will never win his way through. And if he did manage that, nothing would have been achieved. He would have to fight his way down the steps, and, if he managed to do that, nothing would have been achieved. He would have to stride through the courtyards, and after the courtyards the second palace encircling the first, and, then again, stairs and courtyards, and then, once again, a palace, and so on for thousands of years. And if he finally did burst through the outermost door—but that can never, never happen—the royal capital city, the centre of the world, is still there in front of him, piled high and full of sediment. No one pushes his way through here, certainly not with a message from a dead man. But you sit at your window and dream to yourself of that message when evening comes. First I will try to provide a methodological scheme for this presentation, in other words I will propose a set of conceptual tools for analyzing the transcultural object. It is important for me to focus on transculturalism not as a mode of perception but as a mode of production, crystallizing in what we shall call the transcultural object. So far we have dealt with a global, pluri-cultural framework of interpretation for different types of works—a framework that relocates the meaning of all ‘local signifiers’ into a broader, de-localized space of interpretation. However, I would rather take the opposite angle: the transcultural object as a cultural product that, instead of favoring the average global validity of all perspectives, challenges the intrinsic localness of all recognition systems. There is an ambivalent utopianism that emerges as soon as we address this kind of object, insofar as there is something programmatic about the importance of the arts in the production of radical singularities—in other words, regarding art as the laboratory of difference. (When I say art, I am referring less to a system of production than a system of understanding and recognition.) Here I would like to address how, in certain cases, art operates transculturally, and which type of critical agenda might that type of functioning serve. Implying an alteration in the ecology of interpretation, transcultural objects can be regarded as ‘toxic’ for a culture based on identity and common denomination. Although certain amongst those objects may stand as models for a cultural production based on difference and interpretive experimentalism, I don’t think such a vision of the transcultural object should be exactly considered subversive or ‘utopian’. To summarize, my goal here will be to oppose a transcultural cultural practice to the reductive paradigm of global art. My methodological approach is simple. I have chosen one object that could be acknowledged as a token of this ‘transcultural’ or ‘mutant’ visual production. I will take some concepts from Tetsuo Kogawa’s critical work, and I will develop some comments on Borges’ theory of translation. Thus proceeding, a set of ideas will hopefully emerge, which I consider useful in order to read the chosen transcultural instance. The transcultural object in question is a film with three dates of birth, no screenplay but, instead, a floating text working as a blank palimpsest: a collective cross-written/unwritten/rewritten piece, full of jargon and mystification and, also, an extreme case of free translation. The title of this film is Shaolin Dolemite, and this information should be enough for the time being. Yesterday Alexandra Chang referred to a metaphorical definition that seems useful to me: the transcultural object is like a tapestry elaborated with multiple heterogeneous threads. We could also venture a more literal definition: the transcultural object is the result of the merging of a number of signifiers from heterogeneous (even incommensurable) cultural contexts, no matter how authentic or stereotypical those signifiers were. This mosaic-like object encompasses disparate features into one ‘thing’: it is a meeting platform, a crazy semiotic party, in other words, an aberration. Maybe we could say, with Damien Roach, that the transcultural object is like pizza, especially one of those preferred by the Teenage Mutant Ninja Turtles. Yet I am afraid the metaphor of pizza does not do much justice to the field of semiotics. The transcultural object emerges as a collage, according to the aforementioned principles of juxtaposition but, against the traditional definition of collage, it is not an ‘inorganic’ collection of fragments gathered into one frame; it rather works as an organism that synthesizes those disparate fragments into a single, fluid body or locus. The surface of this kind of object is smooth, une surface lisse. As you all might remember, Peter Bürger in his celebrated Theory of the Avant-Garde defined collage as an ‘inorganic’ structuring principle for the modern artwork, understood a polymorph, symbolic object that is composed of non-articulated parts. However, I think the transcultural object functions or behaves organically even if the parts are incommensurable, heterogeneous and disparate. As a locus, the artifact is defined as an interpretive territory; a locale. At least in this sense, its continuous surface helps the topographic parallel. This symbolic territory is, as such, a constructed reflection, allowing the self-exploration of subjectivities under construction. One of my arguments here will be that this type of transcultural object has a history of its own, distinct from, or even opposed to, globalized culture. While the transcultural object reflects a subjectivity under construction, or in question, the globalized artifact informs a pre-fabricated mode of delocalized identification—delocalization standing in fact as the opposite of transculture. After the first day of this seminar, I think it seems quite clear to all of us that there is no closed meaning to the term ‘transculture’. But if we accept this word as a useful one, we have to assume its etymological implications. ‘Trans-’ implies movement, transit, changing from one location to another, metamorphosis. ‘Trans-cultural’ defines something as it shifts in between cultures; it can also be the testimony of a collision that it bears as a message. In other words, the trans-cultural object emerges not for, but as the result of a transmission between multiple locales. As a symbolic product, it is the territory where such transmission may be observed. In this framework, the word ‘ transmission’ is therefore crucial. Tetsuo Kogawa, a Japanese performance artist and an activist of free radio, has developed the notion of transmission against both the traditional idea of a message-sending operations and the metaphor of the medium as a ‘pipe’. For Kogawa, the transmission is a coupling of two instances approaching each other, not the action of A sending a message to B. The transmission is an encounter, a temporary locus. This doesn’t imply that the emitter and the receiver are equal, but they only exist through each other, in their encounter, no matter how delayed this encounter is. When a transmission occurs in different spaces simultaneously (like in radio broadcasting), we can talk about a multiplicity of encounters, each of them representing a fold of the initial ‘message’. The multiple occurrences of this encounter draw a number of analogous, simultaneous locales. Whichever are the content and medium, the two ends of transmission always produce a singular coupling. This coupling is a fold. We can also talk about folds in reading, or in beholding an artwork. The more folds occur, the more the transmission material appears to be rich. (This could be a definition of a good work: rich in folds.) Especially in the times of the Internet, says Kogawa, the transmission has become ‘trans-local’. 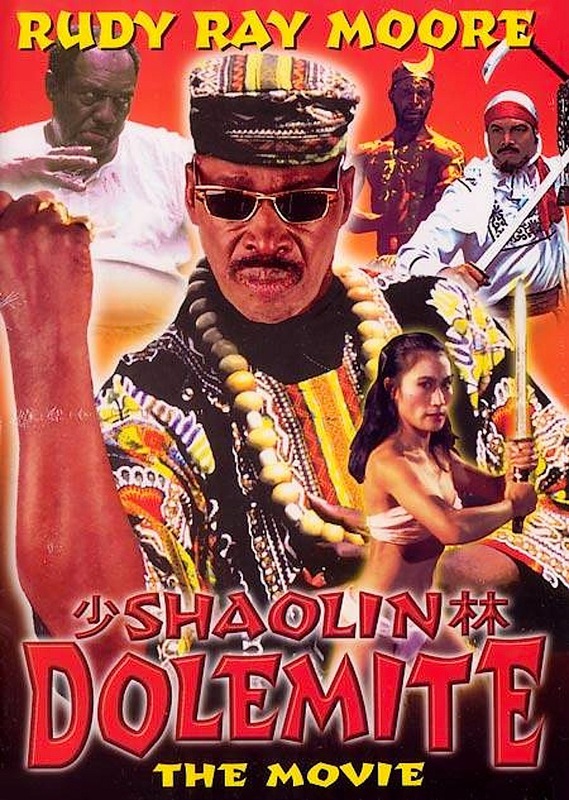 “Shaolin Dolemite.” Film Poster. A Film by Robert Tai. USA, 1999. When we deal with a transmission between people who are foreign to each other, a transmission linking two foreign territories, we have to call upon the mediating figure of the translator. Translation, as you will have observed, once again implies a motion. Within the transmission, the translator, the mover, occupies a very specific place: we can say that, located in between emitter and receiver, he replaces the medium. The translator-transmitter supplies an additional, viable medium. But we can also say that the translator assumes the role of an emissary, a messenger; ultimately, he is the doppelgänger of the emitter. The translator hears the message from the dying king and runs bringing it to someone, and in this act of bringing the message he can get lost. The translator (who operates the motion, the shift) enables the connection between two remote spots. For this, he has to transform the message. Once again, we find the idea of the fold, if we consider that a translation can never be definitive. It is never a final transmission. All translations can be reformulated or amended, until the translator gets lost in the fold. With regard to translation, film dubbing appears to be a very specific, problematic space. The translation not only has to provide a verbal doppelgänger of the source text, it also has to fit in the visual context that accompanies it. Translation being a very old human practice, you will agree with me if I say that dubbing is a purely modern phenomenon, as recent in history as sound cinema. Does a Brazilian movie, no matter the content, inevitably become a transcultural object when dubbed in Russian or Cantonese? Yes, but we can go further: imagine a movie that has no original language, dubbed from the very beginning. Imagine furthermore that this movie locates its action in a territory that we could only define as not-China, a fake country were pseudo-voodoo rituals coexist with bad Western painting, pan-Asian martial arts and American slang. That film exists, and its title is Shaolin Dolemite. Borges, Jorge Luis. Otras inquisiciones (1937-1952). Buenos Aires: Sur, 1952. Courtesy of River Campus Libraries, University of Rochester, USA. In 1935, Jorge Luis Borges wrote his essay ‘The Translators of the Arabian Nights.’ In this text, Borges exposes some of his most characteristic ideas on translation. For me, it exemplifies the transcultural formation far beyond the ideological paradigm of ‘modernism’ (not to mention its more ideological ‘post’- phase). The initial aim of Borges’ text was to illuminate a certain conflict, a war of translators ‘translating against each other’. These translators were Maurice Galland, who produced the first European version of the Arabian Nights (in French); Edward Lane, a strict Arabist, the translator of the first English version; then Sir Richard Francis Burton, a Romantic adventurer who produced an erotically expressive counterpart to Lane’s; J.C. Mardrus, a French translator who adapted the Nights to the taste of modern French sensibility; and finally, Enno Littmann, the prototype of the neutral translator, who provided the German version, impeccable yet seriously flattened, of the great Arabic tales. I will emphasize very briefly the two main characteristics of Borges’s approach. First, Borges uses the Spanish language to compare the translations of Lane, Galland, Burton, Mardrus, and Littmann, which are English and French and German. This gesture could not be less innocent in a man who read and wrote in five different languages, including those I just mentioned. By translating translations in order to compare them, Borges deliberately erases the border between translation and rewriting, his essay internally working as an interpretive fiction. There is a very important passage in Borges’ text, when he says that most problems come from the fact that the translator is not allowed the freedom of the draftsman—thus pointing out that the translator, if such a figure exists in the visual arts, would be herself an artist. Borges gives examples of Gallicism in Mardrus and illustrates this case with passages from the text, but before doing so he translates them into Spanish. Becoming the translator’s translator, Borges blurs the clues he wants to emphasize. His thesis is that the good translator has to reinvent the text, giving it a new homeland in the language of import. The translator’s task is to rewrite the work in order to recreate a figure of meaning. In order to understand why Borges develops this thesis in the context of the Arabian Nights, it is important to remember the history of the Nights as a text. The famous Arabic collection is itself a translation of diverse collections of folk stories from Persia, India, Turkey, Mesopotamia and Egypt. Spanning over several centuries, the collection passed through various transformations before reaching the oldest known Arabic compilation in the 12th century, in Egypt—a translation itself. Furthermore, the 1001 Nights were given several different titles before being known as such. “Arabian Nights” Film Still. A Film by John Rawlins. USA, 1942. These and other details lead Borges to accurately declare that the original authors of the Arabian Nights were also translators, and therefore those who intend to translate the Nights into another language have to assume necessarily the role of authors. Ironically, Borges repeats this very gesture in his critical study of the translations: he rewrites, too, the translations of the Nights—and so he rewrites the Nights, yet partially. Every translator reinvents the Nights as if he was interpreting a musical score. Here we find, once again, the figure of the fold that we expressed regarding transmission. 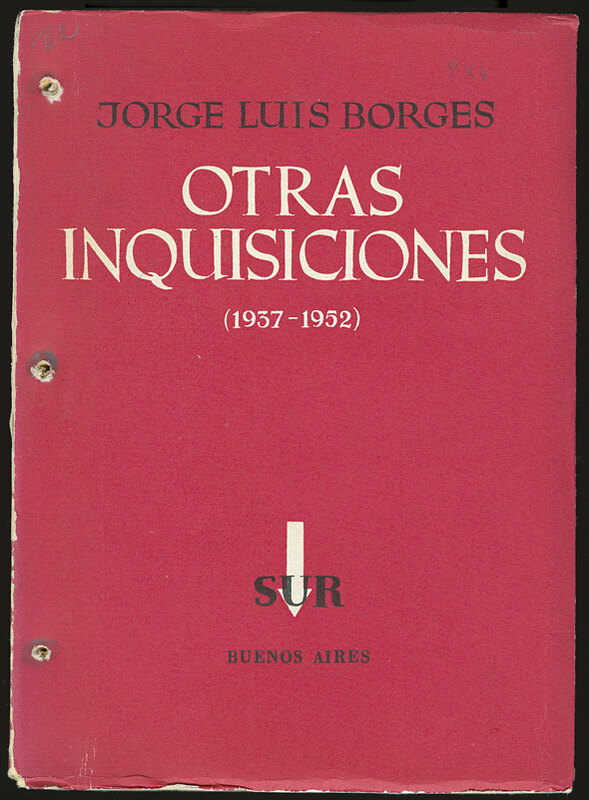 In 1952, another essay on translation titled ‘The enigma of Edward Fitzgerald’ was included in Borges’s Other Inquisitions. Edward Fitzgerald was the man who first translated the exquisite Rubayat of Omar Khayyam, the great Persian poet and mathematician. Borges synoptically depicts Khayyam’s life, then proceeds to do the same with Fitzgerald’s. Khayyam and Fitzgerald are separated by seven centuries. Their lives are remote in time and space, but a miracle operates a convergence of both in one book. Khayyam’s collection of epigrams was not large enough to stand out in the literature of his time; Fitzgerald, in spite of a notable talent for literature, was never consistent enough in his writing. But when Fitzgerald undertakes the translation of the Rubayat, a fusion of both authors’ sensibilities takes place. The book, Fitzgerald’s Rubayat, was received as a master achievement of English literature, giving both Khayyam and Fitzgerald a place of exception in the modern Parnass. Borges argues that Fitzgerald-plus-Khayyam constitute a new author; in other words, Fitzgerald adds a new book to English literature without removing it from the Persian; he duplicates the text. Borges sees this mystery as an invitation for ‘metaphysical conjectures’: Is Edward Fitzgerald a reincarnation of Omar Khayyam? Are both one and the same dramatis persona, played by two different actors in two different periods of time, for God’s entertainment? Or is it just the happy coincidence of two lives, producing a new figure in their merging? The truth is, and this will be the important point for us, that Fitzgerald’s Rubayat stands as one of the first cases of trans-genetic literature in modern times. 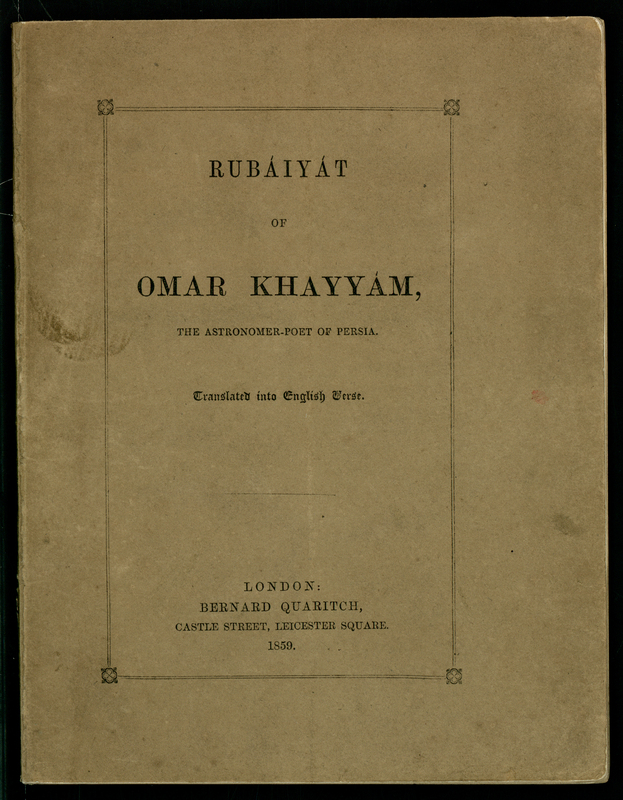 The Rubaiyat of Omar Khayyam, translated into english by Edward FitzGerald. Courtesy of Harry Ransom Center, The University of Texas at Austin, USA. Trans-genetic writing, suspended authorship, transmission as space, dubbing and fold, multiplication of differences: we have briefly outlined a set of concepts that might be useful to consider the transcultural object, or the gaps that separate traditional and modern transcultural objects from such contemporary bastardized sub-products as Shaolin Dolemite. Before showing you a clip from this outrageous feature, here are some key facts on its production. This mutant movie is the work of director Robert Tai, who also appears as one of the main characters in the picture. Robert Tai was born in Taiwan in 1953. After his education at Fu Shing Opera, Tai began choreographing kung fu movies, and before turning twenty-five years old he was already working for the famous Shaw Brothers in Hong Kong. 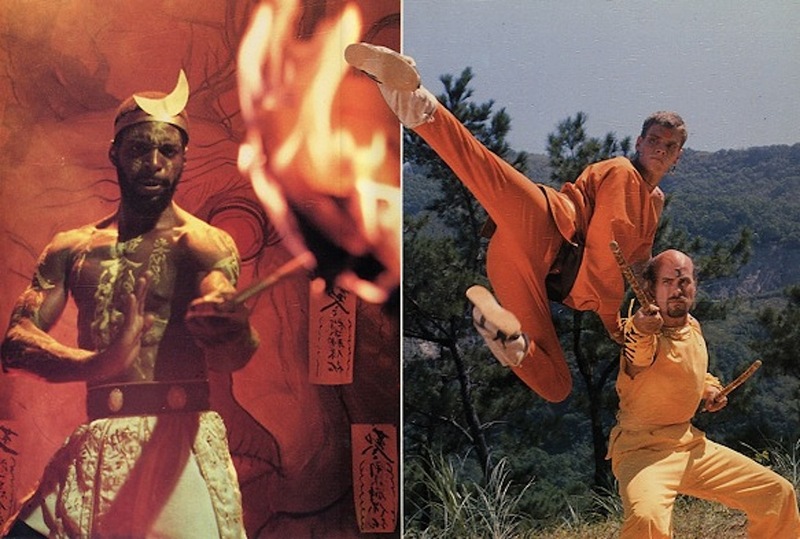 In 1978, he left the Shaw house and returned to work in Taiwan, where he designed some of the most memorable combats in Chinese martial arts movies. It is worth noting that in this type of cinema the plot is the least important aspect: they are like musicals, but instead of musical numbers with singing and dancing, we have fight scenes where different moods are expressed (tragic, heroic, comical, burlesque, etc.). Tai was not only one of the most important fight choreographers, he was also a pioneer in the use of wires for fighting scenes, as well as original hybrid plots where aliens, giant insects, ninjas, traditional Chinese peasants and monks would interact for the first time in history. In the early 1980s, Robert Tai began his career as a director. After shooting a 13-hour length series for TV in 1985, he decided to reuse this material for a cut-and-paste movie. This is how a legend of underground kung-fu cinema was born: Ninja the Final Duel. Since this first proof was a great success, Tai decided to do a second movie using leftovers from the same TV series. But Ninja the Final Duel 2 did not get any attention from Western distributors at the time. Only in 1999, one of the American actors named Toby Russel convinced Tai to add some new elements to the footage and present the movie under a new title. Ninja the Final Duel 2 featured a strange African-American villain named Tupac, a ‘mysterious magus from the West’. This element might have inspired Russel and Tai to invite Rudy Ray Moore, alias the Dolemite, an icon of third-rate Blaxploitation, to appear in some interstitial clips where he comments on the adventures of a band of Shaolin adepts against the malefic Tupac. Thus the first version of the film is cut once again and interspersed with new clips. Some details can be added on the extremely cheap visual texture of this movie, full of papier maché, foam rubber, and ketchup. The film, as we said, is made out of leftovers from a TV series and remixed with some new takes. At least three image grains can be distinguished in the feature. There is no script, no screenplay. An interesting aspect of Robert Tai’s cinema is the fact that loose plots coexist with extremely written action scenes, prepared minutely by Tai himself. The music soundtrack was stolen from other TV series not cheaper than the proto-Ninja the Final Duel; there is perhaps a clip from an album of The Alan Parsons Project, too. The musical theft imbues the film with an abstract, ready-made atmosphere. However, the most relevant aspect for our discussion today comes in terms of voice dubbing. 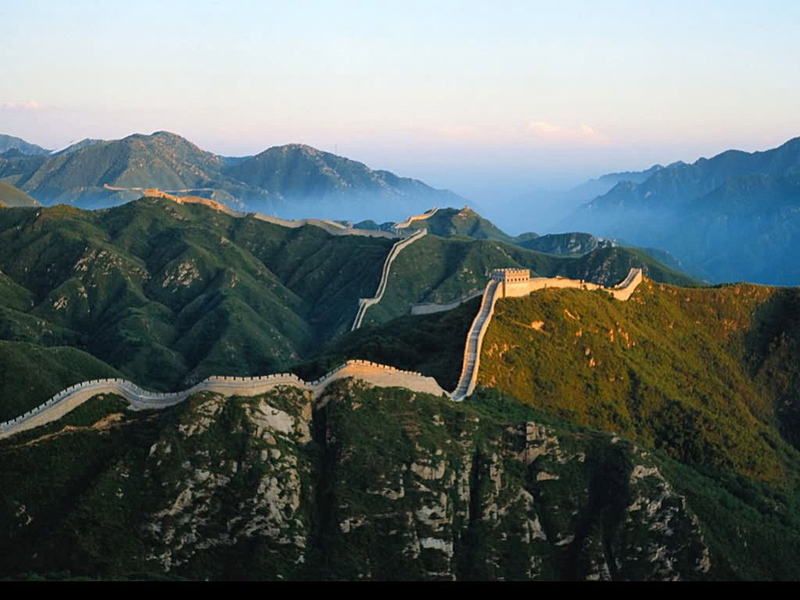 The TV series had been shot in various languages and dubbed in homogeneous Taiwan Chinese. When Russel and Tai decided to reissue Ninja the Final Duel 2 as Shaolin Dolemite, they had to dub the movie again into English, but they had no script. No one provided the dubbing crew—who did not understand the original language—with an English translation, so they had to improvise all the dialogues. This detail is extremely important when considering the sound level of Shaolin Dolemite as an oral performance. In this sense it is almost dissociated from the visual level. The dubbing timing is approximate, and rarely corresponds to the vocalization of the actors. No detail on the identity of the dubbing team appears in the film credits. On the other hand, Robert Tai declared in an interview not to know what is exactly said by the American voices in the movie, although he was sure the result ‘matched’ the original. To support this, I will also show you some of the extra features of the DVD, containing sequences that remained undubbed.